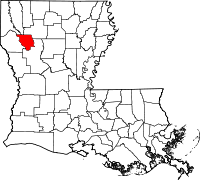 Red River Parish, named for the Red River, a tributary from the Mississippi to the east, which runs through it, was founded in 1871 during the Reconstruction period following the Civil War. It is a small parish with less than 10,000 residents. The Court Recorder, connected with the Red River Parish Clerk of Court, is where inquiries with regards to the parish vital records should be directed. The Recorder is located in Coushatta, LA, at 615 East Carroll Street, and is open from 8:30AM until 4:30PM on weekdays. The phone number the office can be reached at is (318) 932-6741. In addition, a number of online records directories list information for the parish. Following the Civil War, the parish area experienced a long period of civil unrest, culminating in the Coushatta massacre where dissidents murdered several prominent state politicians and others.